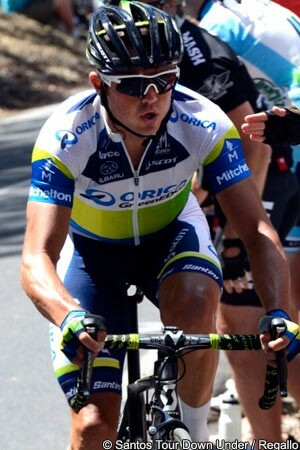 Simon Gerrans (Orica-GreenEdge) took his third win of the 2013 season as he easily managed to outpace the remains of the front of the peloton in the opening stage of the Vuelta a Pais Vasco in Elgoibar. The former Australian champion was by far the fastest of the 17 riders that arrived at the finish together after a late crash, followed by a fast, technical descent, had decimated the bunch and caused several contenders to lose ground. Peter Velits (Omega Pharma-Quick Step) anticipated Gerrans’ sprint, and managed to latch onto the Australian’s wheel on the slightly downhill finishing straight, but the Slovakian rider was unable to come past on the line. Angel Vicioso (Katusha) managed to win the fight for third place, over Francesco Gavazzi (Astana). "The plan of attack was formed around me today,” said Gerrans afterwards. “The whole team committed to the stage win. It’s nice to repay the team’s work at the end of the day. Christian [Meier] did a great job looking after me early on in the stage. The rest of the guys rode fantastic in the hills. They set me up for the stage win and Pieter [Weening] up for GC. The break of the day came from Amets Txurruka (Caja Rural) and Laurent Didier (RadioShack-Leopard), who escaped in the early kilometres and managed to get 5’15” clear in the first half of the 156.5km stage. The peloton gradually pulled back the fugitive duo though and, despite Txurruka jumping away in the final 35km, the race was all together with 18km to go. Disaster struck several riders close to the top of the 2nd category Alto Aisastia, with just over seven kilometres to go, as a crash in the middle of the peloton caused a split. Belgian hopeful Jurgen Van Den Broeck (Lotto-Belisol) was among those to actually come down, but several more were delayed by the incident as a group of less than 50 riders sped clear. Pressure from Alberto Contador (Saxo-Tinkoff) on the descent that followed ripped the winning group of 17 clear in the final five kilometres, from which Gerrans proved by far the quickest to the line. After getting away as part of an early seven-man group, Txurruka and Didier escaped on the 2nd category climb of the Alto de Asensio and, over the top after 30km, had managed to get 2’24” clear. The gap continued to grow on the descent that followed and, by the 47km point, it was up to 5’15” before two-time race winner Alberto Contador’s Saxo-Tinkoff team began the steady task of pulling them back. Over the 2nd category Alto de Endoia with 68km to go, the gap was down to 3’15”, and it continued to fall as the two leaders scaled the 1st category Alto Azurki that followed shortly after. As they passed over the top with 56km to go, Txurruka and Didier had just 2’23” of their advantage left. Into the final 40km the Blanco Pro Cycling, Euskaltel-Euskadi and Astana teams all swarmed forward to take over from Saxo-Tinkoff. The Danish team was not yet ready to give up control, however, and the resulting increase in speed saw the gap to the leaders tumble on the approach to the small 3rd category bump of the Alto Kalbario. Txurruka jumped away from Didier as the climb began, with the peloton less than a minute behind them; as the Basque rider sprinted over the top, with 34km to go, the RadioShack-Nissan rider was 49 seconds behind him; the peloton was now 1’32” back and gaining on Didier. The Luxembourg rider was quickly caught after the short descent but, with 25km to go, Txurruka was still a minute clear. Saxo-Tinkoff was beginning to accelerate further, however, still not allowing any other teams to get ahead of it, and five kilometres later the tiring lone leader was just 15 seconds ahead. He was finally caught with just over 18km to go. AG2R La Mondiale and then Team Sky took over the head of the peloton on the approach to the 2nd category Alto Aisastia, with the British team stringing out the peloton behind it. Movistar took over as the climb began, ramping the pace up further. A crash near the front of the peloton with less than half a kilometre to climb saw Van Den Broeck and Dries Devenyns (Omega Pharma-Quick Step) among the fallers, and split the peloton in two. Orica-GreenEdge and Team Sky increased the pace yet again, over the top of the climb and onto the descent; as Contador himself took the lead into the final five kilometres, his descending skill split the front group further as the finish approached. Other likely contenders at the front included Pieter Weening (Orica-GreenEdge) - who was also driving the pace - Jakob Fuglsang (Astana), Romain Kreuziger (Saxo-Tinkoff), Richie Porte and Sergio Henao (both Team Sky), Nairo Quintana (Movistar) and Tejay van Garderen (BMC Racing), but several more were in the second part of the group which was beginning to detach on the fast, switchback descent. Under the flamme rouge there just 17 riders in the front group, but the second group was gaining as the roads levelled out. Having been led into the finishing straight by teammate Weening, Gerrans launched his sprint and Velits was just unable to come past on the line. Samuel Sánchez (Euskaltel-Euskadi) led the next group of 20 riders over the line five seconds back.